I was never much of a cook before kids. My husband and I ate out quite a bit, and the meals we did eat at home were pretty limited and often from a box. Quite frankly, my meal of choice was cereal. But when I became a mother for the first time, I realized that I could not raise a family on cereal and instead, I needed to manage our grocery expenses and cook beyond a box. At the same time I discovered Ina Garten roasting a chicken on the Food Network. She took what seemed to me like an advanced cooking technique and made it seem so easy. So when I stumbled onto a grocery case full of Perdue oven roaster chickens that had been marked down to $2, I took the plunge. If I screwed it up and the chicken turned out inedible, I wasn’t wasting a lot of money. I bought 5 of those chickens and for the first time in my life I roasted a chicken and it turned out to be delicious! I was hooked on cooking and I was sold on buying marked down meat. The meat is typically marked down because it is near the use by date or the store has too much of a product and it needs to be cleared out, as was probably the case with the Perdue chickens. Over the years, I’ve found all types of meat marked down, such as organic chicken, ground meat, and sausage. To be honest, most of the meat that I buy is marked down. Learn how your favorite stores mark down their meat and if they do so at a certain point in the day. Talk to the meat department manager to find out how and when they mark down their meat. There was a time when my local stores marked down the meat first thing in the morning, but that has changed and I find marked down meat at all times of the day. But it is first come, first serve. I do the majority of my food shopping at Giant of PA or Weis Markets and even if meat is not on my grocery list, I always walk through the meat department to look for marked down bargains. Giant uses yellow stickers for their markdowns which makes them easy to spot in a distance. Weis Markets has large white % off or $ off stickers on their marked down meats. What to do with marked down meat when you get home. If you’re not going to use immediately, store in your freezer and when you’re ready to use, thaw the meat in your refrigerator. Cook as you normally would. Cook the meat immediately and store in your freezer until you need it. On this particular day, I scored on meat that we regularly eat. 5 packages of breakfast sausage marked down to about $1 a pack. The regular price was $2.99/lb. 4 packages of name brand chicken thighs and drumsticks that totaled about 11 pounds. The package listed: no antibiotics, cage free, no hormones or steriods, and fed all veg diet. The regular price was $2.49 a pound. The packs were on sale for $1.98 a pound, but each pack had coupons that brought the price down to about a $1 a pound. I browned the 5 pounds of breakfast sausage and put in a freezer bag. Now it’s ready for those busy hectic mornings. We just need to reheat in the microwave. I immediately stuck the chicken in the freezer and am not searching Pinterest for some new slow cooker recipes. If the marked down meat doesn’t look fresh, then pass it by and you might even want to alert the store. But typically the marked down meat I find looks just like the package next to it that has a use by date that is further out. I have never experienced a problem with marked down meat, and I save 40%-75% off most of the meat that I buy! What about you? Do you buy marked down meat? Let us know in the comments. Store had buy one, get two free on packages of boneless skinless chicken, each package had a $3.00 off sticker as they were close to date. Each package was about $9.75. With two free and $9.00 in coupons, I paid .75 cents for about 12lbs of chicken. ok, you win!! That’s a phenomenal deal. Congratulations! Where I shop the marked down meat has an orange tag. Almost all the meat I buy is orange tagged. I have never had a problem with quality in the 18 years I have been buying it. 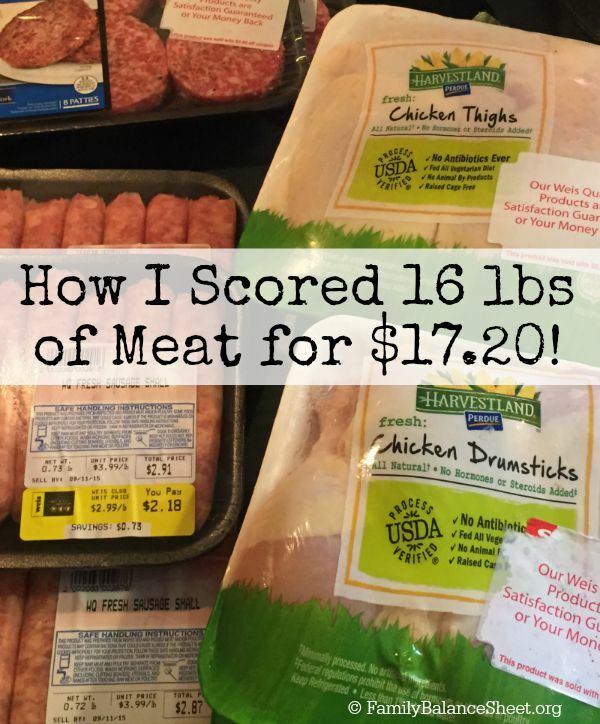 Just last week I bought 12 lbs of ground chicken, which my family loves, for $.79 a lb!! What a great deal on the ground chicken. Thanks for sharing your success story. Saw a tweet about this from CoupleMoney – fantastic find! The best part is that the closer you are to the source and the less human intervention has happened with your food, the healthier it’s going to be. I definitely look for the butcher’s specials, because there’s usually nothing wrong with them, particularly if I’m going to cook that day or the next. Otherwise, I put it in the freezer, and when I need it, I have it. You just have to be more diligent about not letting that meat sit out too long, as it probably doesn’t have much shelf life left. I’ve been inattentive to salmon on more than one occasion and pulled out slimier-than-when-it-came-from-the-sea fish which had to go in the garbage along with a torrent of epithets as I threw it away. oooh, I would be in tears if I had to throw salmon away. Thanks for stopping by to read and comment, Jason. I have bought marked down meat for years. My last big bargain was 6 pork loins at about $5.00 a piece. I had 2 cut up into chops and put the other 4 into my freezer to cook in the crockpot. I love the meat sales at Kroger & the markdown section! Great idea! Thanks for sharing. That was nice of the butcher to cut up the loins into chops. It doesn’t hurt to ask and now you have variety for meals.